El Mesón de la Cava. It doesn’t sound like your typical Caribbean dining choice. But, let’s break this down. It’s in a cave – sure. Interesting food selections (not to include jerk chicken – it’s not that kind of place). Why not? 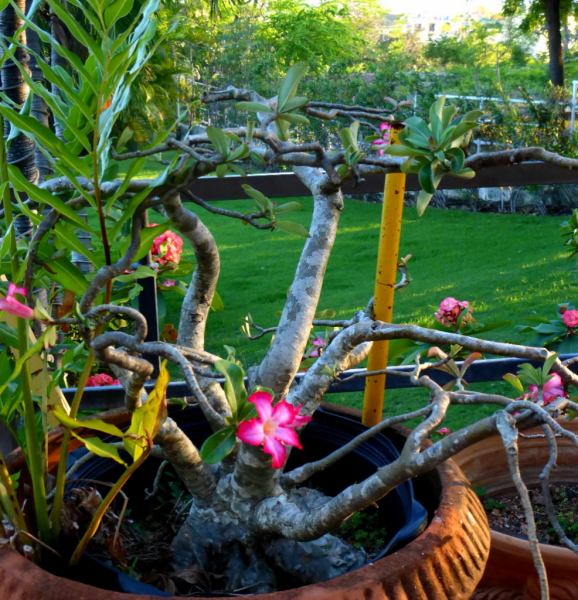 Put them together and you have a romantic atmosphere in the center of Santo Domingo, and an unexpected find for us that we’re glad to share. 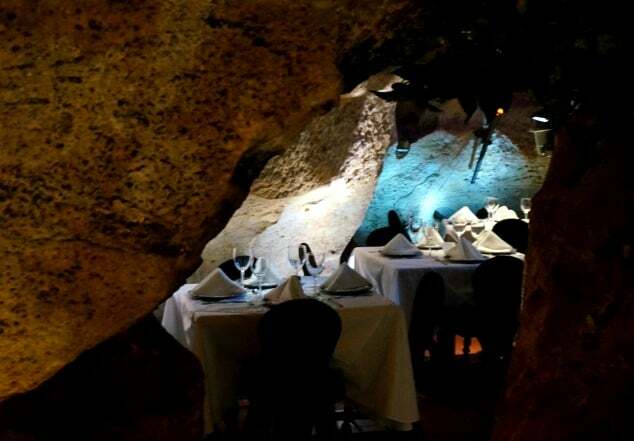 The cave that houses the restaurant has a rich history. It is a natural limestone cave, carved out by the surf (when this spot was on the coastline) over a period of millions of years. The resulting cavern gave shelter to numerous groups including pirates, buccaneers and natives hiding from multiple attackers wanting pillage this splendid island. Currently, your only threat here is your appetite and potentially your wallet. The prices in the restaurant reflect the exotic interior – but that’s what you’d expect. The exterior of El Mesón De La Cava resembles a shell situated in a small garden. Enter and you look out to sunny terrace bar area where you can also grab a drink and a meal (at about half the price as in the cavern). Head down the spiral staircase and you are greeted by formal wait staff who will show you to your little romantic cove nook. 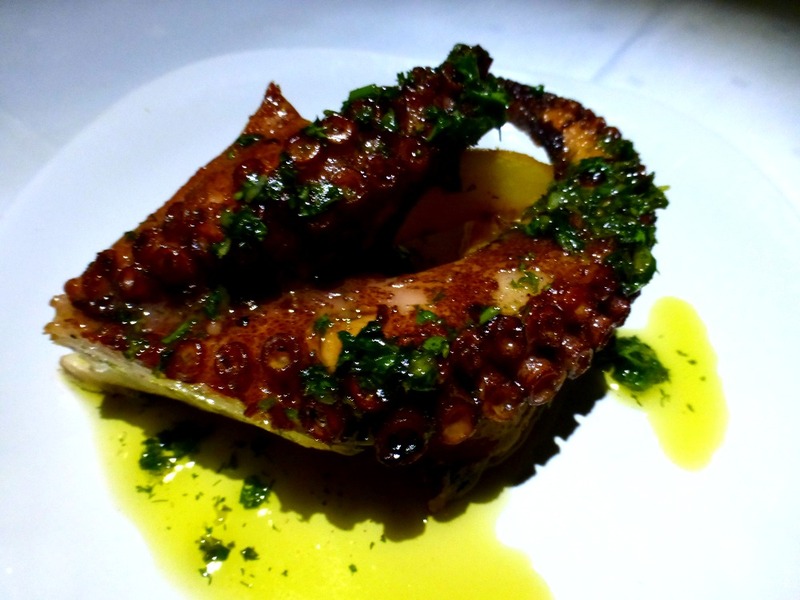 We chose to start with the octopus appetizer – grilled on wood embers and served over roasted potatoes. Not something we would normally order, but why not go a little exotic to make things more memorable. It turned out to be a really good choice. The octopus had a really mild flavor, similar to scallops, with a consistency not unlike a plump calamari. The flavor from grilling it over the wood embers was very slightly charred and really fantastic. 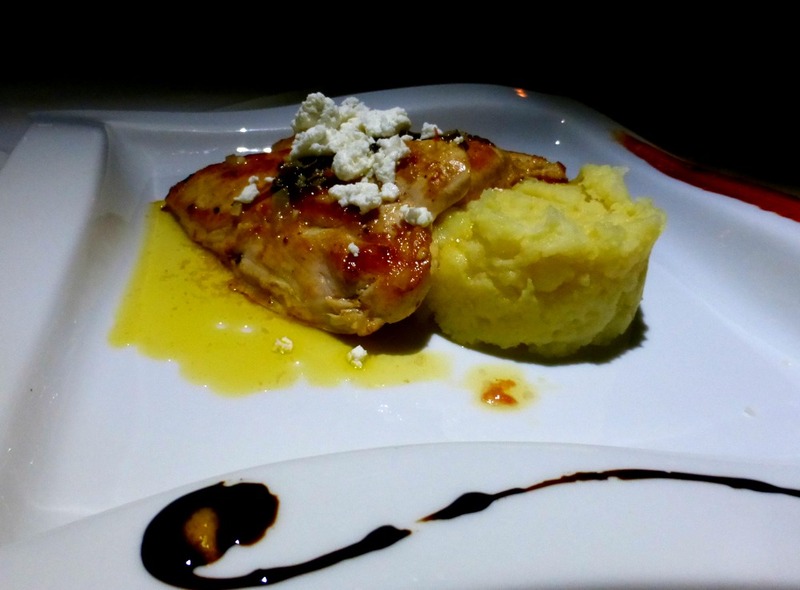 Then we went for the Chicken with Goat Cheese and Red Pepper sauce over mashed potatoes. The flavor was good but it was honestly slightly dry. Good excuse for that second glass of wine – yes, please. We went early so we actually had the place to ourselves and the staff were very gracious in allowing us to snap pictures to our hearts content. What more can two bloggers want? Overall it was a really memorable meal and an experience that I can recommend. Especially if you take along someone special. The restaurant promises and delivers a unique atmosphere, interesting food and great service. 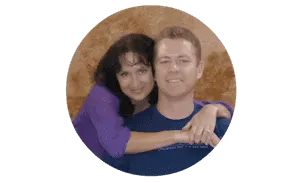 The romance, that’s up to you! WWow this place looks spectacular, I would spend more time taking pictures than enjoying the food. Now this experience looks very cool. A rare gem of exotic architecture and fine dining. Wonderful pictures, great color. I’d be interested to know the food prices too. Here’s a link to the menu: http://elmesondelacava.com/menus/menurestaurant.pdf The chicken dish was about $13.00, the Octopus appetizer just under $14. Not bad really…. This place looks so unique and fun! Thanks for sharing! The place looks amazing. So does the food!!! Probably is a bit expensive but sometimes we deserve a treat!! This looks like a great place for a treat. 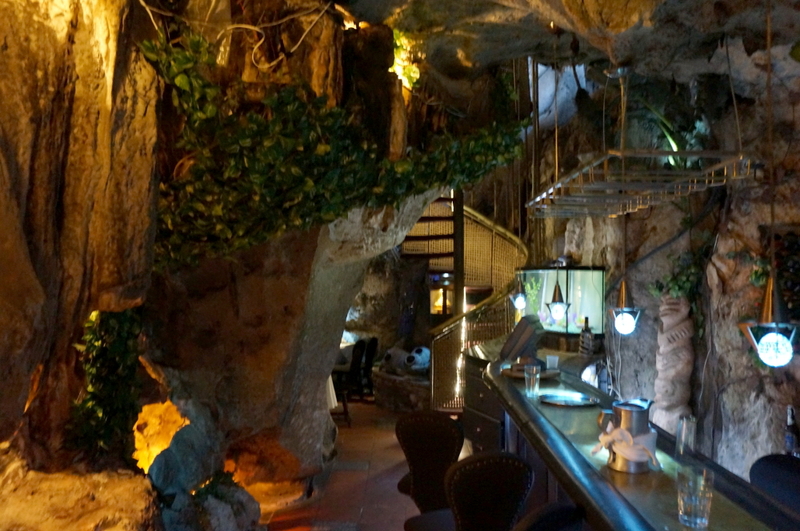 I love the idea of eating in a cave although I can imagine it would be quite chilling. 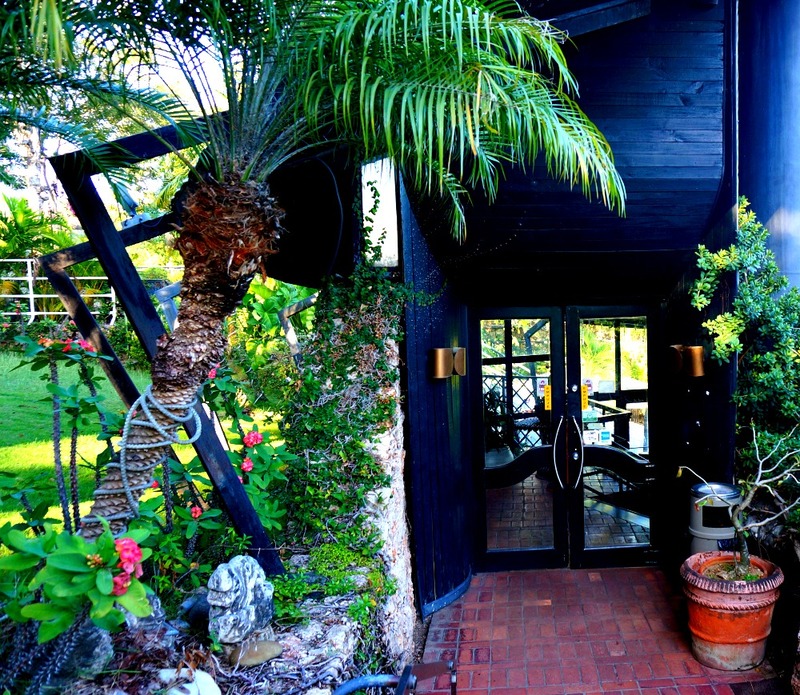 The outside terrace bar also looks quite tropical set in beautiful grounds. What a great place – and the food really does look good! Sounds like this place offers more than a cool atmosphere! Glad you enjoyed your time there. This is all so cool! That cave looks like a great experience. What a romantic spot. Looks like the perfect place to celebrate Valentines day! Oh, this experience is so delectable! I would love to replicate it! 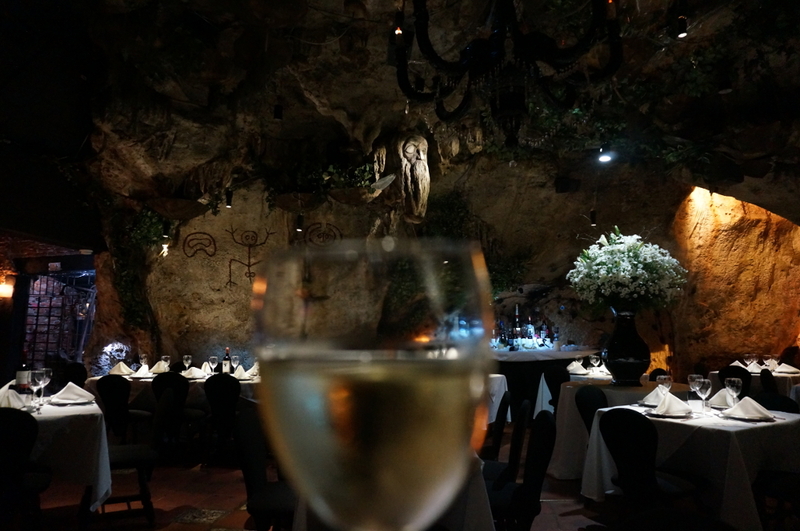 Your photos capture the mood of descending into the unique atmosphere of the site so well, and they’ve truly done an exceptional job fitting quality appointments in the setting to match up with the food. Awesome. I just love this! I am a romantic at heart and I love places that are quirky and unique and inspire visions of fairytales and fantasy which this restaurant definitely does. 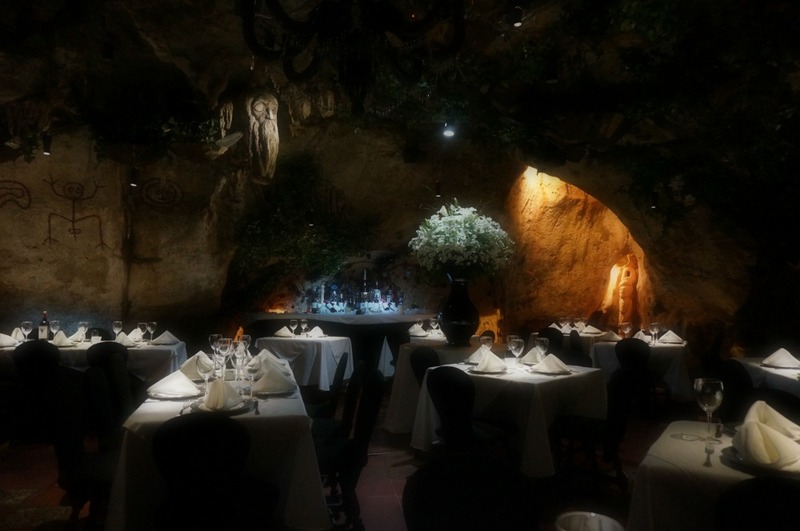 Although not a cave setting it reminds me of the dinner we had at a beach in Puerto Vallarta called Rythms of the Night. It was all lit by fire and candlelight. Oh, I would so love for my husband and me to dine at this restaurant. I just got back from Turks and Caicos where we visited limestone caves. So I can imagine how pretty this restaurant must be. Santo Domingo looks like a cool city to visit. I bet the venue comes at a premium, but likely it is very much worth it. Thanks for sharing! WOW! What an experience. And your blog transported me there. Not to mention whetted my appetite! Wow, just added to the bucket list! Thanks for sharing a special moment with us.